South Korea's sole aerospace company failed to win a contract to supply next-generation military jet trainers to the United Arab Emirates (UAE). According to the Ministry of Knowledge Economy on Feb. 26, 2009, the T-50, made by Korea Aerospace Industries Ltd. (KAI), lost out to the M-346, made by Italy's Alenia Aermacchi. The news came as a big disappointment to S.Korea as Seoul has been pitching to sell the jet since 2005 against the backdrop of the pan-national efforts with President Lee Myung-bak and National Assembly Speaker Kim Hyong-o leading the way in recent months. 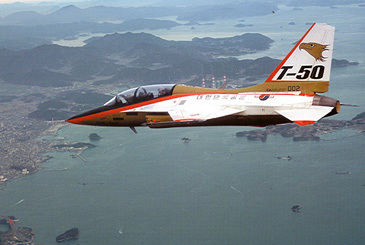 The T-50 made its maiden flight in August 2002, with the initial batch of 25 production aircraft delivered to the South Korean Air Force last year. It is currently the only modern supersonic military jet trainer in the world. Italian company had pulled ahead in recent months despite such efforts, however. Italy's Alenia Aermacchi was reported to have pledged a substantial support package to help the UAE build up its nascent aerospace industry, which KAI just could not match, according to Yonhap News. Italy's close ties to the Middle East and past military dealings that span decades gave the M-346 the winning edge. Since the performance of the South Korean jet has been properly tested and highly rated by experts, the T-50 will take part in similar future bids that could give a boost to the local arms industry. South Korea's total arms exports topped $1 billion for the first time last year. The country, which started selling ammunition, small arms and uniforms, currently markets armored personnel carriers, tanks, self-propelled howitzers, propeller-driven basic trainers and various warships. KAI, located in Sacheon, 437 kilometers southeast of Seoul, meanwhile, claimed that its jet, although more expensive than the M-346, outperformed its rival in most respects and is ideally suited to meet the requirements of Air Forces needing an advanced trainer that can be used as a light attack and air defense aircraft. "The UAE looked at both performance and other factors and it was the latter that decided the outcome of the bid since most pilots are impressed with the South Korean jet," Yonhap News quoted an executive who wished to remain anonymous as having said. He said that while Wednesday's announcement, made in Abu Dhabi, was a disappointment, the T-50 will be marketed to other countries that have a need for hightech trainers. The company did not elaborate but said Singapore is looking for an advanced jet, while talks are underway with countries like Poland. The UAE contract, estimated to be worth US$1.27 billion, calls for the building of 48 jets for the Middle Eastern country.